Between Christmas and New Year a car at the bottom of Argent Street/ Anthony Street, Easington Colliery got set on fire. This entry was posted in Easington Colliery and tagged Arson, Car Fire, Easington Colliery on February 19, 2018 by Richard. This morning, I heard that sometime yesterday there had been yet another arson attack in Easington Colliery. This house fire in Barwick Street, Easington Colliery, is as far as I know, the forth one to have occurred in the A and B streets since March of this year. 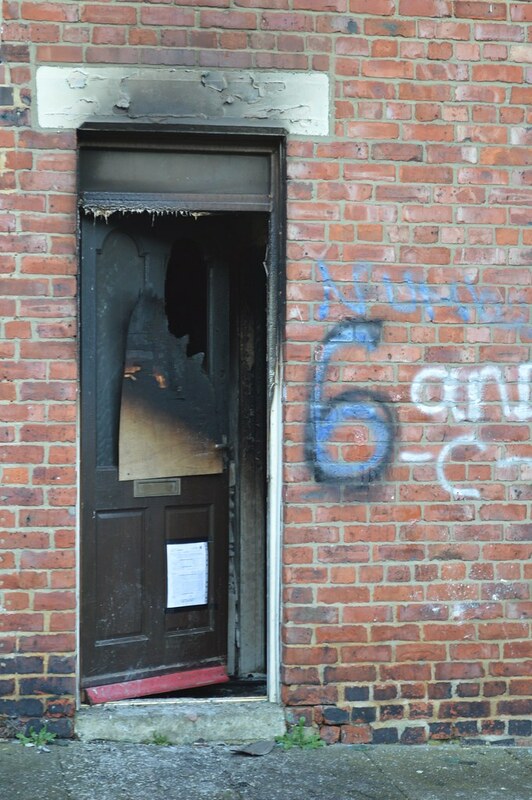 After hearing about this latest arson attack I wandered over to Barwick Street to see for myself. I walked down the back of Barwick Street first, where a police car was parked outside of the burnt out house, to snap a few photos. At the front of the property there was another police car parked up. Presumably the two policemen have been parked in their cars overnight. It’s interesting that despite Easington Colliery residents being told that money is tight, and resources are limited, they can afford to have two police vehicles just sitting there for so long. If they actually patrolled the A and B streets regularly then maybe incidents like this wouldn’t happen in the first place. 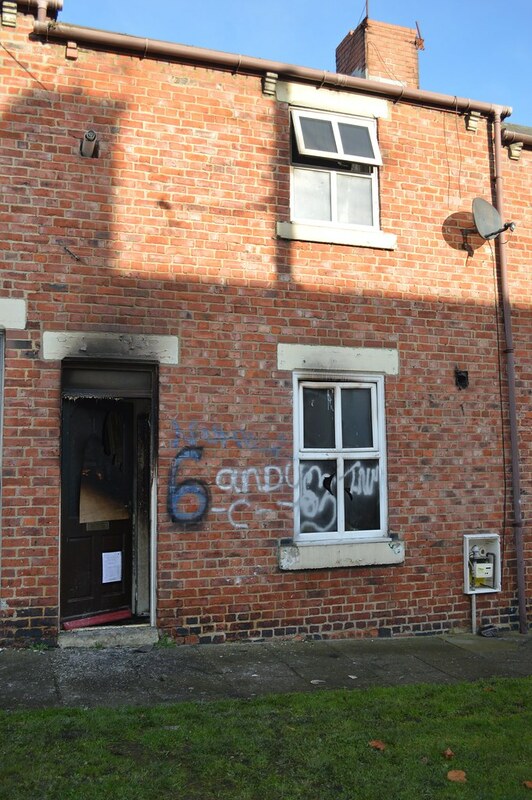 Unlike two of the previous three arson attacks, the Barwick Street property is not an end of terrace house, it has neighbouring properties on either side. 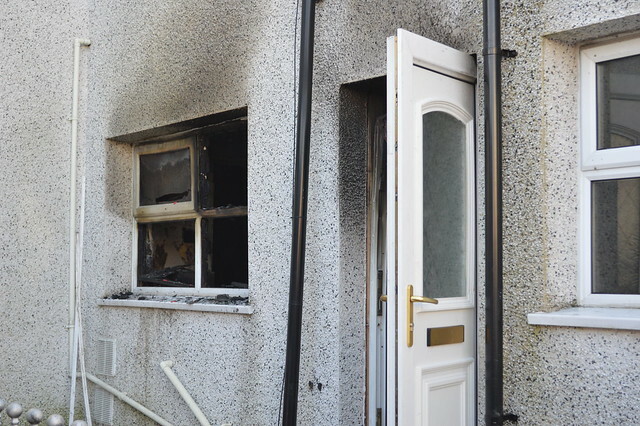 Thankfully, by the look of it, the fire did not spread to the adjacent houses, forcing any tenants to move out, which is what happened after the arson attack in Anthony Street; the lady who lived next door had to move due to smoke damage which left her with nothing. At a recent Easington Colliery P.A.C.T. meeting, which was attended by local residents who are all understandably concerned for their safety, after the previous arson attacks, the police in attendance said that they would be taking a, ‘Zero Tolerance’ approach to much of the criminal activity that happens here. This was welcome news to members of the community who were at the meeting, to be told that the police, and council, were taking things seriously. But unfortunately, no sooner had the words ‘Zero Tolerance’ been said, they were more or less immediately retracted, by, ”but we don’t want to give the offenders criminal records that could negatively affect the rest of their lives, blah blah blah…….”, despite the fact that these criminals are making the lives of the local residents seriously intolerable. That statement proves that the police put the wellbeing of criminals above that of the decent people living here, who deserve to feel safe in their own homes and in this community. People who have worked hard all of their lives and just want, and deserve, to live their lives in peace without feeling threatened or in danger. So, basically, the police won’t be taking a ‘Zero Tolerance’ approach to anything, least of all serious crimes such as arson. No doubt this latest fire in Barwick Street will be mentioned at the next P.A.C.T. meeting, and like all previous meetings the officials in attendance; councillors, police, and a representative from Durham County council, will once again lie about what they are doing to resolve the many problems in the A and B streets, and elsewhere in Easington Colliery, and then as usual they will brag about the obscene amounts of money they waste on vanity projects; many thousands of pounds, in an area where lots of residents are struggling to survive and having to use the food bank. The sad fact is the council and the police just do not care. Maybe they consider everyone who resides in the A and B streets, and other parts of the colliery, to be scumbags, who don’t deserve the right to live a decent and safe life. As long as the councillors and police are alright, and it’s not their homes that are being attacked by arsonists, or their lives that are being made unbearable and miserable by anti-social behaviour, and criminal activity, they will continue to do nothing. Their complete disinterest in actually doing anything about the myriad of problems in Easington Colliery is clear for anyone who attends the P.A.C.T. meetings to see; the councillors spend a lot of time checking the clock on the wall, obviously wishing the hour away until they can leave and go back to their comfortable safe lives. It’s not surprising that there has been another arson attack in Easington Colliery, when the people responsible know that they will not be caught, and that the police don’t want to punish them, or take any action that will result in them receiving a criminal record. People only behave as badly as you let them, and it’s common knowledge that in Easington Colliery you can get away with anything, including arson. What is it going to take until the officials, who are employed, or elected, to help look after the best interests of the residents of Easington Colliery, actually start doing the job they are paid or elected to do. I will not be attending the next P.A.C.T. meeting, or any future meetings, it is a waste of my time, and no doubt that’s exactly what the councillors and police want, for no members of the local community to attend the meetings, because then they can kid themselves that they have done a good job, and there are no social problems or crimes to be dealt with in Easington Colliery. 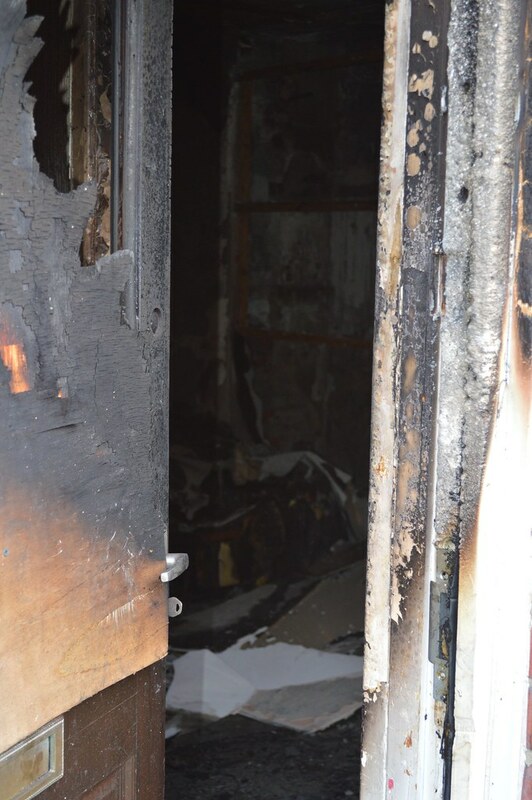 This entry was posted in Easington Colliery and tagged Arson, Easington Colliery, Fire on November 13, 2016 by Richard.